聂兆君, 赵鹏, 秦世玉, 王佳, 郭佳佳, 李江鹤, 刘红恩. 氮锌配施对冬小麦根土界面锌有效性及形态分级的影响[J]. 植物营养与肥料学报, 2018, 24(5): 1185-1193. NIE Zhao-jun, ZHAO Peng, QIN Shi-yu, WANG Jia, GUO Jia-jia, LI Jiang-he, LIU Hong-en. Effects of combined application of nitrogen and zinc on the availability and fraction of zinc in root-soil interface of winter wheat[J]. Journal of Plant Nutrition and Fertilizers, 2018, 24(5): 1185-1193. Abstract: 【Objectives】 Nitrogen (N) is critical for zinc (Zn) absorption by roots and Zn accumulation in grains of winter wheat. This paper investigated the effect of combined application of N with Zn on the availability and chemical fractions of Zn in root-soil interface of winter wheat, which helped to investigate a possible mechanism for increase of Zn uptake by winter wheat through combined application of N with Zn, and to provide a theoretical basis for improving Zn contents in grains of winter wheat through reasonable N application. 【Methods】 A rhizobox experiment with three N application rates (N 0, 0.2 and 0.4 g/kg) and two Zn application rates (Zn 0 and 10 mg/kg) was conducted to analyze the Zn concentrations in aboveground parts, available Zn, pH and Zn chemical fractions in rhizosphere and non-rhizosphere soil of winter wheat. 【Results】 Combined application of N with Zn (N0.2Zn10 and N0.4Zn10) significantly increased the dry matter biomass and Zn concentrations in aboveground parts of winter wheat. At Zn0, N0.4 treatment significantly increased the available Zn contents in the rhizosphere soil. 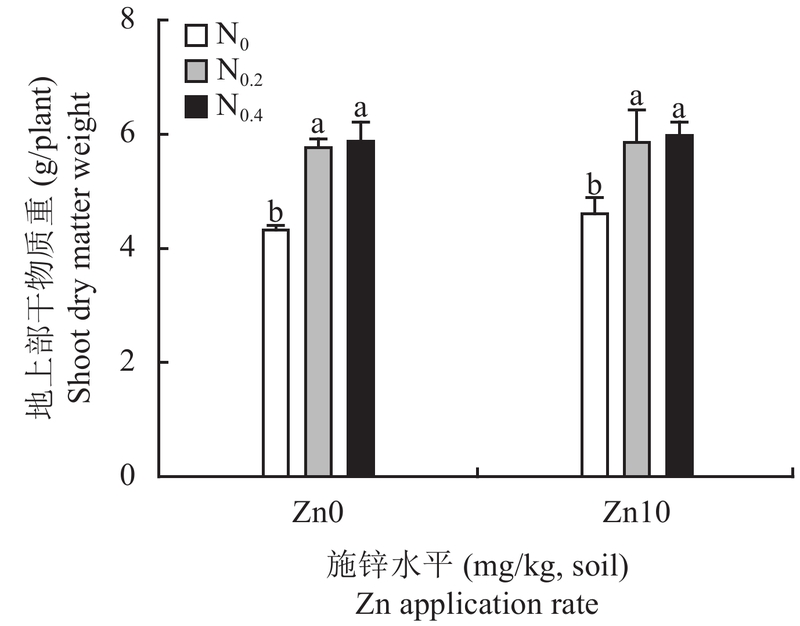 At Zn10, N0.4 and N0.2 treatments decreased the available Zn contents in the rhizosphere soil, while increased the available Zn concentrations in the non-rhizosphere soil. 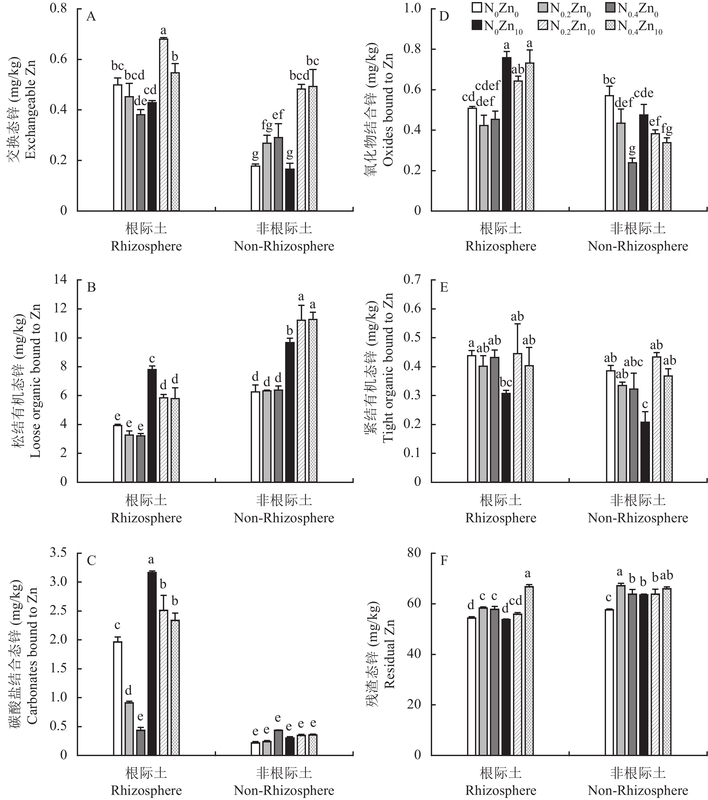 Regardless of Zn application, N0.4 and N0.2 treatments significantly decreased the rhizosphere soil pH, but did not affect the non-rhizosphere soil pH. Meanwhile, at Zn0, N0.4 and N0.2 treatments significantly decreased exchangeable Zn and carbonate bound Zn in rhizosphere soil, Fe-Mn oxides bound Zn in non-rhizosphere soil, and increased exchangeable Zn in non-rhizosphere soil, and residual Zn in rhizosphere and non-rhizosphere soil. At Zn10, N0.4 and N0.2 treatments significantly increased exchangeable Zn in rhizosphere and non-rhizosphere soil, loose and tight organic bound Zn in non-rhizosphere soil, and residual Zn in rhizosphere soil, but decreased loose organic and carbonate bound Zn in rhizosphere soil and residual Zn in rhizosphere and non-rhizosphere soil. 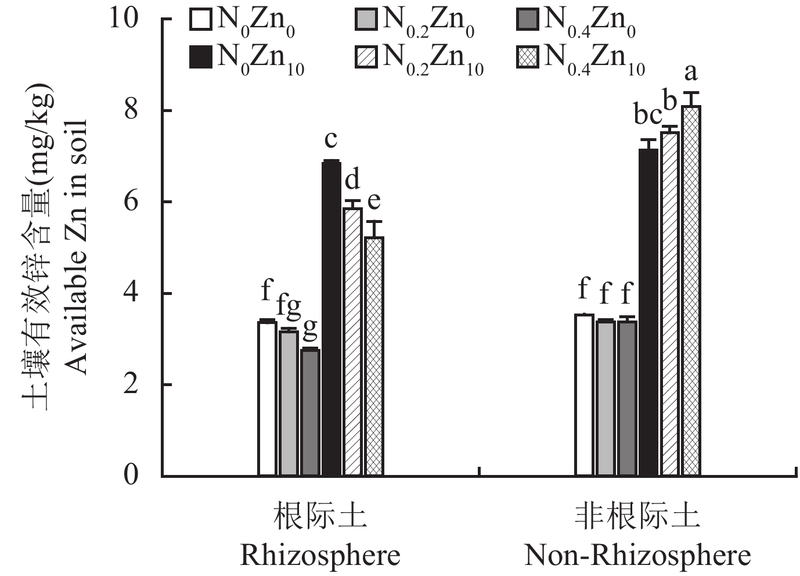 【Conclusions】 Combined application of N with Zn increased Zn concentration and enhanced the absorption of Zn by winter wheat, possible because of the combined influence of wheat root and the combination of N and Zn on the reduction of rhizosphere soil pH, promoting transformation of Zn from loose organic bound and carbonate bound fraction to exchangeable fraction to improve the bio-availability of Zn in soil. 谢小丽, 王敏奇. 锌和硒对动物免疫功能影响的研究进展[J]. 中国饲料, 2008, 13(20): 123–125. Xie X L, Wang M Q. Research on the effects of zinc and selenium on animal immune function[J]. China Feed, 2008, 13(20): 123–125. 颜世铭, 宏昭毅, 李增禧. 实用元素医学[M]. 郑州: 郑州医科大学出版社, 1996. Yan S M, Hong Z Y, Li Z X. Practical element medicine [M]. Zhengzhou: Zhengzhou Medical University Press, 1996. Bouis H E, Hotz C, McClafferty B, et al. Biofortification: a new tool to reduce micronutrient malnutrition[J]. Food and Nutrition Bulletin, 2011, 32(Suppl. 1): 31–40. Cakmak I. Enrichment of cereal grains with zinc: Agronomic or genetic biofortification?[J]. Plant and Soil, 2008, 302(1): 1–17. 张勇, 王德森, 张艳, 等. 北方冬麦区小麦品种籽粒主要矿物质元素含量分布及其相关性分析[J]. 中国农业科学, 2007, 40(9): 1871–1876. 曹玉贤, 田霄鸿, 杨习文, 等. 小麦和小黑麦籽粒的营养品质及其相关性分析[J]. 西北农林科技大学学报(自然科学版), 2010, 38(1): 104–110. Cao Y X, Tian X H, Yang X W, et al. Variation of nutritional quality and their relationships in wheat and triticale grain[J]. Journal of Northwest A&F University (Natural Science Edition), 2010, 38(1): 104–110. Hotz C, Brown K. Assessment of the risk of zinc deficiency in populations and options for its control[J]. Food and Nutrition Bulletin, 2004, 25: 91–204. 刘铮. 我国土壤中锌含量的分布规律[J]. 中国农业科学, 1994, 27(1): 30–37. Liu Z. 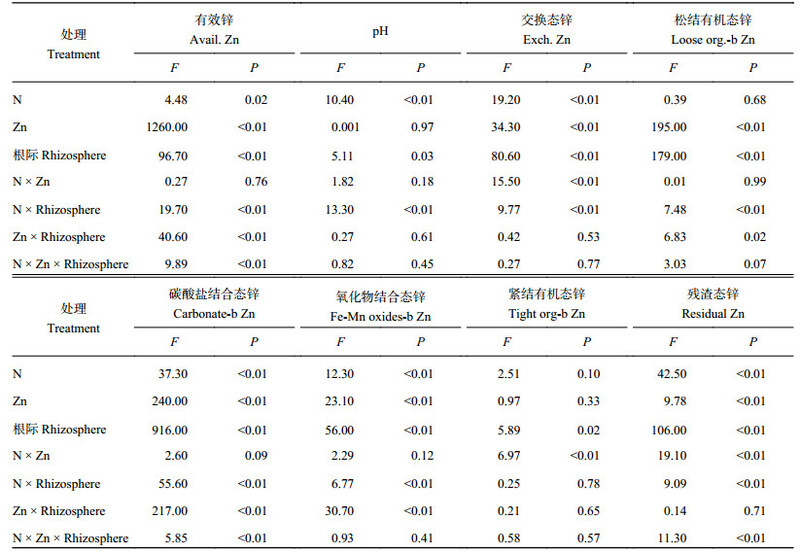 The distribution of zinc content in soil in China[J]. Scientia Agricultura Sinica, 1994, 27(1): 30–37. 孙德祥, 蔡德龙. 河南土壤微量元素的含量和地理分布研究[J]. 中原地理研究, 1984, (1): 79–88. Sun D X, Cai D L. Study on the content and geographical distribution of trace elements in Henan soil[J]. Central Plains Geography, 1984, (1): 79–88. 刘娟花, 国春慧, 陈艳龙, 等. 锌肥种类和施用方式对土壤锌形态及有效性的影响[J]. 西北农林科技大学学报(自然科学版), 2017, 45(4): 149–156. Liu J H, Guo C H, Chen Y L, et al. 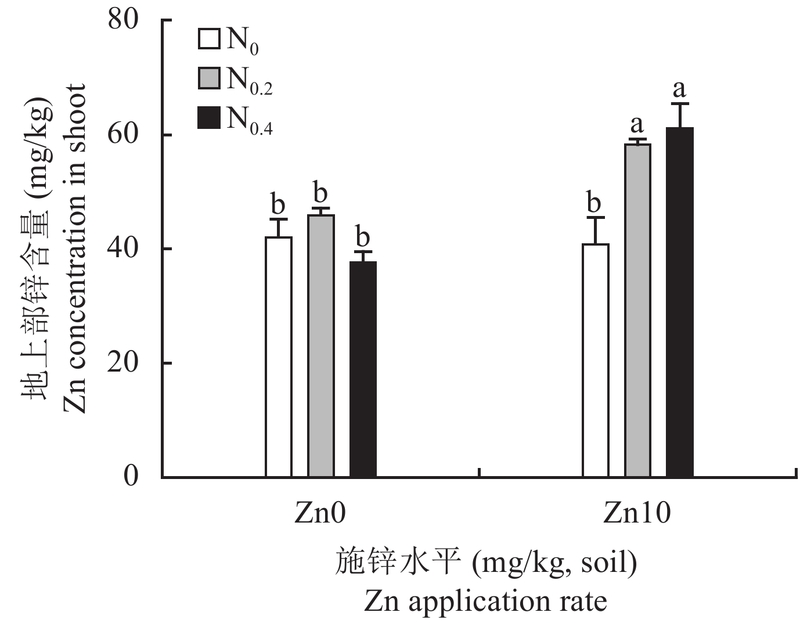 Effect of Zn source and application method on Zn form and availability in soil[J]. Journal of Northwest A&F University(Natural Science Edition), 2017, 45(4): 149–156. 国春慧, 赵爱青, 田霄鸿, 等. 锌源和施锌方法对石灰性土壤锌组分及锌肥利用率的影响[J]. 植物营养与肥料学报, 2015, 21(5): 1225–1233. Guo C H, Zhao A Q, Tian X H, et al. Effects of Zn sources and application methods on the contents of various Zn fractions and Zn fertilizer utilization efficiency[J]. Journal of Plant Nutrition and Fertilizer, 2015, 21(5): 1225–1233. 魏孝荣, 郝明德, 张春霞. 黄土高原地区连续施锌条件下土壤锌的形态及有效性[J]. 中国农业科学, 2005, 38(7): 1386–1393. 闫佳, 张均, 马超, 等. 氮素水平对冬小麦地上部分锌积累和转运的影响[J]. 江苏农业科学, 2016, 44(5): 102–106. Yan J, Zhang J, Ma C, et al. Effects of nitrogen levels on the shoot accumulation and transport of zinc in winter wheat[J]. Jiangsu Agricultural Sciences, 2016, 44(5): 102–106. 靳静静, 王朝辉, 戴健, 等. 长期不同氮、磷用量对冬小麦籽粒锌含量的影响[J]. 植物营养与肥料学报, 2014, (6): 1358–1367. Jin J J, Wang Z H, Dai J, et al. Effects of long-term N and P fertilization with different rates on Zn concentration in grain of winter wheat[J]. Journal of Plant Nutrition and Fertilizer, 2014, (6): 1358–1367. 常红, 周鑫斌, 于淑慧, 等. 小麦氮锌配施效应研究[J]. 西南大学学报(自然科学版), 2013, 35(11): 49–53. Chang H, Zhou X B, Yu S H, et al. Study of the effect of combined application of nitrogen and zinc on wheat[J]. Journal of Southwest University (Natural Science Edition), 2013, 35(11): 49–53. 陆欣春, 田霄鸿. 氮锌配施对不同冬小麦品种产量及锌营养的影响[J]. 中国生态农业学报, 2010, 18(5): 923–928. 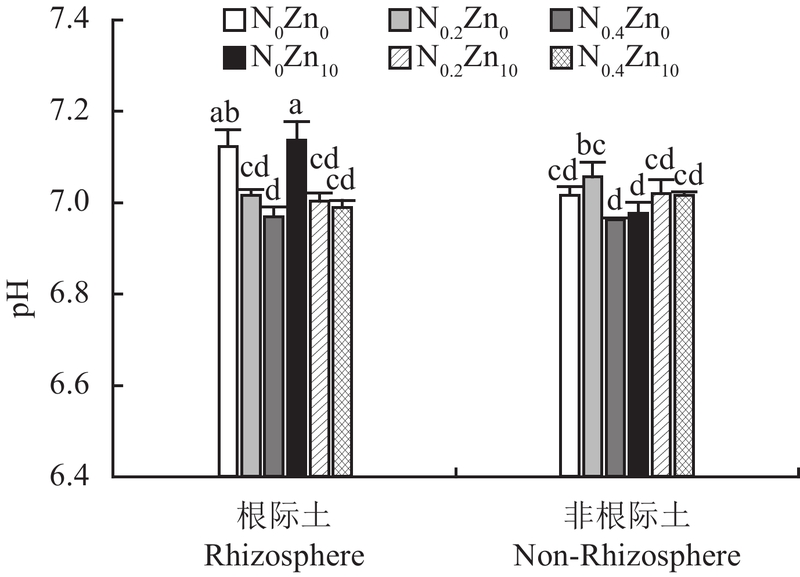 Lu X C, Tian X H. Effect of combination use of Zn and N fertilizers on yield and Zn content in winter wheat[J]. Chinese Journal of Eco-Agriculture, 2010, 18(5): 923–928. 赵鹏, 杨帆, 睢福庆, 等. 氮锌配施对冬小麦氮利用、产量及籽粒蛋白质含量的影响[J]. 中国农业大学学报, 2013, 18(3): 28–33. Zhao P, Yang F, Sui F Q, et al. Effect of combined application of Zn and N fertilizers on nitrogen use, grain yield and protein content in winter wheat[J]. Journal of China Agricultural University, 2013, 18(3): 28–33. Nie Z J, Zhao P, Wang J, et al. Absorption kinetics and subcellular fractionation of zinc in winter wheat in response to nitrogen supply[J]. Frontiers in Plant Science, 2017, 8: 1–10. Alloway B J. Zinc in soils and crop nutrition (Second Edition) [M]. IZA and IFA: Brussels and Paris, 2008. 张福锁, 曹一平. 根际动态过程与植物营养[J]. 土壤学报, 1992, 29(3): 239–250. 施卫明. 根系分泌物与养分有效性[J]. 土壤, 1993, 25(5): 252–256. Shi W M. Root exudates and nutrition availability[J]. Soils, 1993, 25(5): 252–256. 徐卫红, 王宏信, 刘怀, 等. Zn、Cd 单一及复合污染对黑麦草根分泌物及根际Zn、Cd 形态的影响[J]. 环境科学, 2007, (9): 2089–2095. Bao S D. Soil and agro-chemistry analysis (Third Edition)[M]. Bejing: China Agricultural Press, 2000. Mengel K, Kirby A. Principles of plant nutrition (Third Edition) [M]. Bern: International Potash Institute, 1987. 李玉双, 孙丽娜, 孙铁珩, 王洪. 北方常见农作物根际土壤中铅、锌的形态转化及其植物有效性[J]. 生态环境, 2006, 15(4): 743–746. 陈有鑑, 黄艺, 曹军, 陶澍. 玉米根际土壤中不同重金属的形态变化[J]. 土壤学报, 2003, 40(3): 367–373. 徐卫红, 王正银, 袁德厚, 等. 不同阴离子形态锌肥对水稻营养及土壤锌形态的影响[J]. 中国生态农业学报, 2006, 14(3): 52–55. Xu W H, Wang Z Y, Yuan D H, et al. Effects of various anionic zinc fertilizers on the rice nutrition and zinc forms in soil[J]. Chinese Journal of Eco-Agriculture, 2006, 14(3): 52–55.